Squad: Dennis Phillips, George Ross, Fin Halford, Tom Lang, James O’Brien, Jack Wall, Nathan Kemp & Riley Reay. 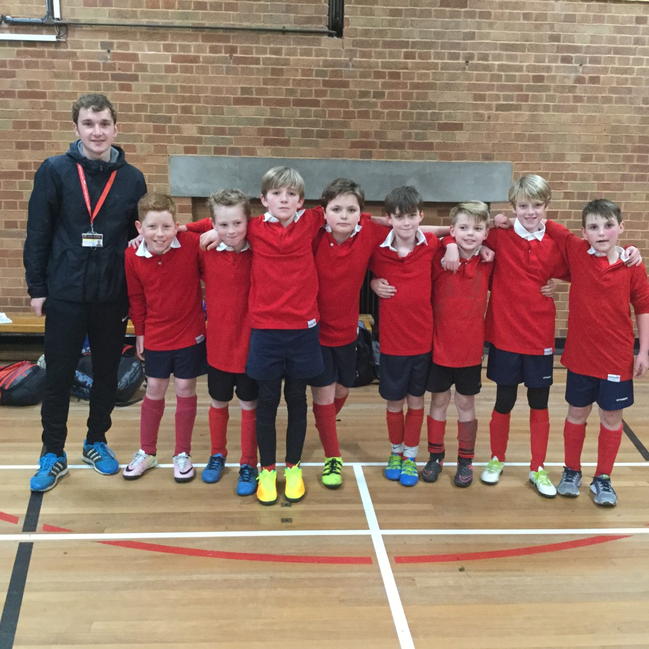 This was the first time the boys have played together and represented the school competitively. With the bus arriving late, we arrived at Strode College 45 minutes late. We were then told that we would have to play all 3 games in a row. The first game was against Elmhurst (A). Considering the small amount of time the boys had to warm up they started quickly. They passed the ball about keeping it away from Elmhurst and playing some great football. Nathan Kemp and Dennis Phillips getting 2 goals each and Fin Halford playing excellently in goal. The final score was 7-2 to Hugh Sexeys. The second game was against a very strong St Benedict’s side. The boys were under pressure throughout the game and went 1 goal down but showed great character to fight back and get a 1-1 draw. The final group game was against Elmhurst (B). The free flowing football returned and with James O’Brien in great form upfront they won the game 5-0. Ending the tournament level on points with St Benedict’s meant that a final was needed. St Benedict’s took an early lead in the final. The boy’s heads didn’t drop and they were the better side throughout with Dennis Phillips scoring a late leveller to take the final to penalties. In the penalty shootout Hugh Sexeys converted all 3 of their attempts and Fin Halford made an excellent save to stop St Benedict’s last penalty meaning that Hugh Sexeys were overall winners! The boys will now move onto the County Finals!